For PMP Certification Exam purposes, you should know that when closing contracts, you need to make sure all claims are resolved. You should also review the entire procurement process so you can learn from the current procurement to improve future procurements. Dispute resolution and procurement audits are two techniques you should know about for the exam. In the event of a disagreement that the contracted parties can’t resolve via negotiation, they need to follow the dispute resolution clause in the contract. Most contracts require the parties to enter into some type of mediation or arbitration. Some contracts require the issue be resolved by using one of these forms of ADR, and others require that ADR be tried before the least appealing alternative of litigation. When the issue or claim can’t be resolved while the project is active, the claim may remain open even though the project has been closed. A procurement audit is a formal review of the procurement process on a single procurement, or for the procurement process used on the project as a whole. The purpose is to review each process in the procurement to identify those areas that worked well as well as those areas that can be improved in the future. Was the make-or-buy analysis complete? Was the contract type appropriate? How effective was the procurement management plan? Did the statement of work (SOW) accurately reflect the work that needed to be done without saying how it should be done? Were the procurement bid documents complete? Were the source selection criteria appropriate? Were a sufficient number of qualified sellers identified? Did the bidder conference go smoothly and answer all bidder questions? Did the procurement negotiations end up with a win-win situation? Was the contract developed and signed in a timely manner? Was the contract complete without requiring numerous changes and revisions? Was the contract sufficiently clear so as not to result in numerous disputes and misunderstandings? When auditing vendors, you want to record areas that worked well and areas that should be improved the next time. This information can be used the next time a similar procurement is needed. 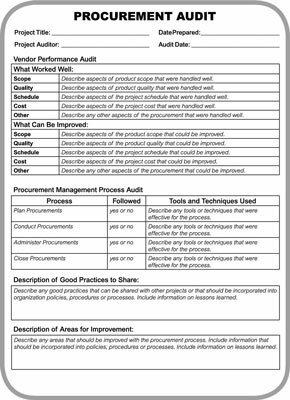 This procurement form is generic, but it shows the type of information that you would gather for a procurement audit. A key part of closing a contract is reviewing the SOW and ensuring that all elements are complete and accepted. You should go through the deliverables list to make sure that all the deliverables meet the contractual requirements, all procedures and contract clauses were followed, and also that all the technical and other contract documentation is available. It’s a good practice to formally accept deliverables throughout the life of the contract, especially for large contracts. Closing the contract should merely formalize all the accepted work that has been delivered. After you accept all the work, you notify the contract administrator that the terms of the contract have been met. The contract administrator can then take the necessary steps to formally close out the contract. The contract documentation is a part of the overall project documentation that you need to archive prior to project closure. Procurements need to be closed out from the legal, financial, and administrative perspectives. Legally, you need to make sure the statement of work is complete and also that all deliverables have been formally accepted. Administratively, you want to make sure that all the terms and conditions of the contract have been followed and also that the procurement documentation has been appropriately archived. Financially, you need to make sure all the payments have been made, including award fees, incentive fees, and fixed fees as appropriate.